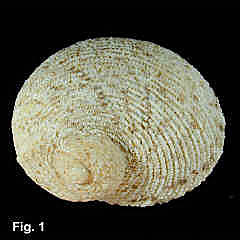 Description: Shell flattened, width about 2.5 times height. Sculptured with finely scaled crowded spiral ribs, about 30-40 at the lip. 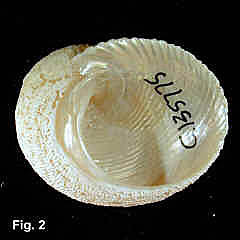 Columella smooth, aperture lirate. Exterior coloration cream to light brown with dark brown spots restricted to the spiral ribs, sometimes arranged in wavy axial lines. Interior nacreous. Size: Up to 43 mm wide, commonly about 25 mm. Distribution: Endemic to Australia; Port Stephens, NSW, to Kalbarra, WA, including Tas. Habitat: Under rocks, often in silty situations, from lower intertidal down to about 20 m. Common.